Today is the last day of Kohl’s Cyber Monday sale and you can get 20% off your entire purchase with coupon code CYBERWEEK at checkout. 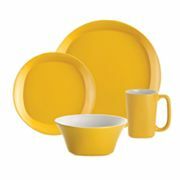 This great Rachael Ray 16-Piece Round and Square Dinnerware Set if already marked down to $39.99 and will be only $31.99 after the discount! You can choose from 4 different colors. This is a great set of dishes and normally sells for $139.99 per set! Shipping is free on any size order today as well. Sale is good through 12/4/2013.